I have a new series that I am super excited about! It's sad that it's taken me this long to update my website, but I have been so busy with everything else writing related, that my site has gone completely neglected. So, I have listed all the books in the series that have been released to date and this is the one coming out on my birthday, June 12th! It has been six years since media mogul, Sebastian Whitmore was killed in a hit and run accident in Atlanta, GA. Sebastian’s death was front-page news, headlining all the media outlets for weeks. Although the case was initially ruled an accident, there was rampant speculation as details of Sebastian’s life and lifestyle suggested there may be more to it than a mere accidental encounter. However, after several dead-end leads, the case turned cold, and the death of Sebastian Whitmore faded into the background, moving from front page news to an afterthought. The Cold Case Division of the Atlanta Police Department has once again turned to the investigative expertise of Dr. Addison Parker, forensic psychologist to resurrect this cold case. Can Addison unravel the mysteries that surround Sebastian and once and for all determine if there was, in fact, someone who wanted the media powerhouse dead? Find out in I’ll Never Tell: Book 5 in the Addison Parker Mystery Series. Seven years ago, Rev. Dr. Eli Jamison was found dead; sprawled across the altar of historical Mt. Pisgah Missionary Baptist Church, in the heart of Mechanicsville, Georgia. There were several people who had motive to murder the infamous pastor, but the Atlanta Police Department hadn’t been successful in finding Reverend Jamison’s killer. Dr. Addison Parker has been charged with the responsibility of resurrecting this cold case. Finding his killer would mean unraveling mysteries and secrets many in Mechanicsville would rather stay hidden. Some would rather the memory of Eli Jamison remain just that, a memory. Addison Parker is determined to change that. Find out if Dr. Parker has what it takes to uncover the secrets to who murdered Eli Jamison in I’ll Never Tell: The Addison Parker Mystery Series, Book 2. Three years ago, a body of a young woman was found at the bottom of an abandoned well. Ever since the body was discovered, and murder was determined to be the cause of death, the Atlanta Police Department struggled to identify a killer. It didn’t take long before the case of Missy Colfax grew ice cold. With the recent success of Dr. Addison Parker’s last case with the cold case division of the Atlanta Police Department, it was natural for the detectives to turn to her again for assistance. Dr. Parker proved herself before, the cold case squad was hopeful she could do it again. But there were those rooting against Dr. Parker; those who wanted the death of Missy Colfax to remain a mystery. They had kept quiet about her death all this time and they had no desire to reveal their secrets now. Would the secrets that kept Missy's death unsolved remain, or would Dr. Parker be able to once again, crack the cold case? 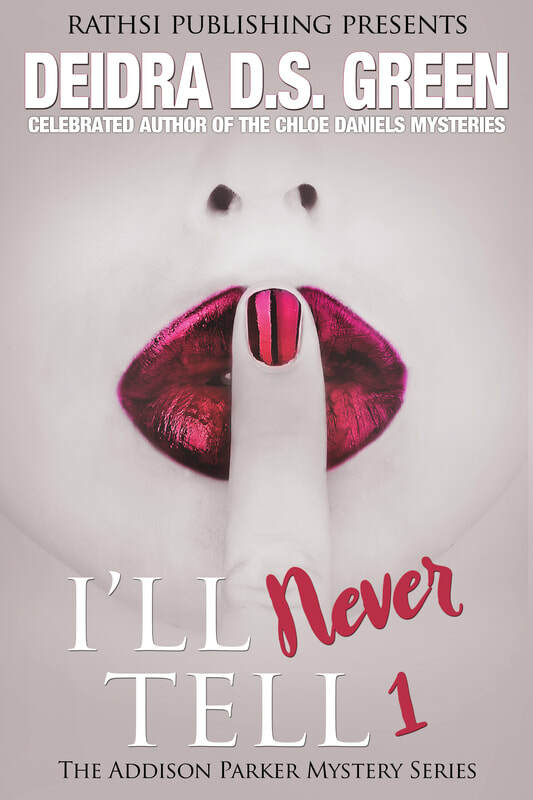 Find out in I’ll Never Tell, Book 3.
en years ago, starlet Priscilla Malone was found dead on the stage of Atlanta’s premiere theater. Although the original investigation determined flat-lined after no suspect was found. The murder of Priscilla Malone ended up a cold case. Once again, Detective McLemore, supervisor of the cold case squad leaned on the forensic expertise of Dr. Addison Parker to breathe life into a dead case. There were some people who preferred that the death of Priscilla remained a memory. Addison Parker refused to allow that to happen. Find out if Dr. Parker has what it takes to unravel the mysteries that surround Priscilla Malone’s murder in I’ll Never Tell: The Addison Parker Mystery Series, Book 4.